If you freeze-frame it right around 10 seconds in, you can pick out the moment the tires went over the inside curb. Freeze-frame it a split second later and the rear tire is off the ground. Badness followed. Newman changed direction in a hurry and avoided having the crash get a lot worse. GB has a couple big dips at the apex in a few corners too. Taking the natural race line results in crashes. Question.Is this normal for Grand Bend? WTF! I did a few trackdays there and never saw anyone that close to the track.I've seen stupid before...and it looks JUST LIKE THAT. That’s normal on race weekends. I've brought up this very issue a year or two ago-for the very same spot- somewhere on this forum. The representative from grand bend (pps? )pointed out to me it was on a soar race weekend (by PM). not his gig. It bothered me then and it still bothers me today. Bikes coming together can shoot off in odd directions - too close for me. Oh wow, I thought that was on the parade lap or something, not a live race. Though it'd be cool to spectate from there, you're pretty screwed if one of those bikes loses it. I guess Isle of Man has it similar where some spectators are right up on the circuit and it's still not as crazy as Group B rally spectators in the 80's. As far as i know those people are pit board crew for guys on track, as there is no pit wall to hide behind. So that is the safest place for them. You cant just go to that area and watch. The other side of the track sees all of the action/incidents on that straight, TBH i raced there for a few years and it never bothered me. Never really bothered me either. But it’s a little funny that you of all people would say that. Who’s bike almost rode itself into the timing trailer? The people being there have never really bothered me, even had my wife giving me signals from that straight in the past! I absolutely HATED the timing tower thing we used a few years ago though! Ah, gotcha. That makes a lot more sense then. Scariest moment I've ever had racing. I thought he was a dead man. Luckily he kinda spun and sat up, but I still managed to clip his helmet(left rubber on it) with the front tire and run over his hand. It wasn't great, but it could have been much worse. Normal for races. Timing/scoring, flagger, and team people signalling. The line through the dogleg pushes you to the right so it's pretty hard to crash to the left, but everything is possible I suppose. I've only seen one person manage it in 5 years. Same thing at Shannonville. The start finish flag station is on the inside of the front straight. You'd have a much better chance of hitting the wall on the left though. Same thing at Shannonville. The start finish flag station is on the inside of the front straight. You'd have a much better rkof hitting the wall on the left though. I wouldn't say this is the same situation as shanny. shanny has a pit wall for the crews to stand behind. Yes there is a flag man/marshall on the inside so I kind of get what you're saying. I've seen video of the trailer parked even slightly closer to the track than it was in this video. trailers don't belong 5m from the track... anywhere on the track...but this is only my opinion. -no trailers are parked along the front straight of shanny. I don't know what csbk does at GB. Do they have a trailer and crews in this spot too? I don't see how the cement wall is a better option in this situation. You can't have a wall at GBM because they run the track both directions. CSBK had team team signal people there as well, they were closer to the dogleg and further off the track. No trailer. Not my show. I just race there. It has never bothered me. If it's a genuine concern to you take it up with SOAR. Im a bit of a safety nut. I have no horse in the race; and I won't be bringing this up with soar. Im only thinking of the riders and crews safety. I wouldn't think it would be too difficult to set the trailer back 15m from track edge. overkill? maybe, maybe not. 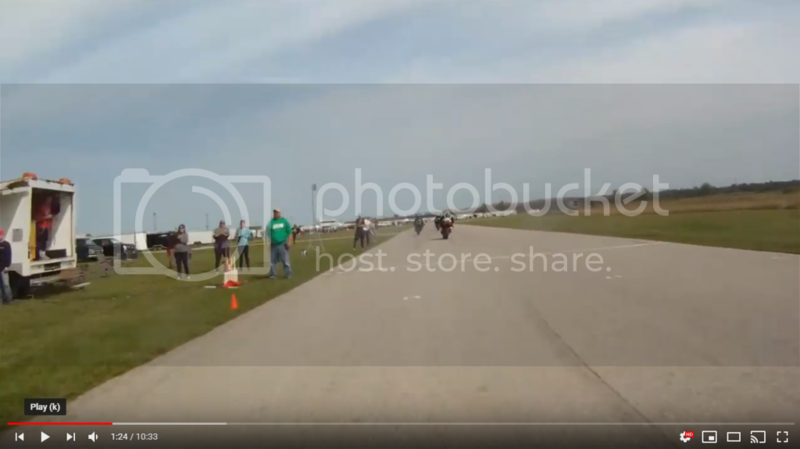 I believe csbk, by setting up closer to the dogleg, further reduces the however so slight chance of a racer colliding into crews/marshalls/trailer? Where the crew/trailer are now, appears to be around the point where the riders begin moving over to the left side of the track (in prep'n for the upcoming right turn). Perhaps a request from a racer to move the trailer back another 10m would be welcomed? I believe in murphy's law. I've been watching your videos for quite a few seasons - where are my manners? thank you for the great entertainment!